Review by AllTheBestFights.com: 2016-08-20, pretty good fight between Carlos Ocampo and Alvaro Robles: it gets three stars. The undefeated Carlos Ocampo entered this fight with a perfect boxing record of 19-0-0 (12 knockouts) and he is ranked as the No.21 super welterweight in the world. He has already fought twice in 2016 winning over Charlie Navarro (=Ocampo vs Navarro) and Ramses Agaton. His opponent, Alvaro Robles, has an official record of 19-5-0 (17 KOs=89%) but he is not ranked as he hasn’t fought since June 27, 2015 when he was defeated by Alfonso Blanco. 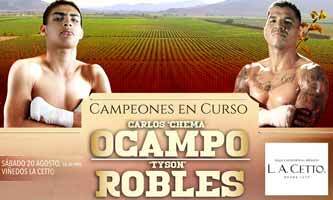 ‘Chema’ Ocampo vs Robles is the main event of the evening. Watch the video and rate this fight!